Alan Weierman has had a rough go of it lately. He has been investigated by the Florida Department of Children and Families on 45 counts of child abuse. Furthermore, Weierman is being accused of forging the signatures of dead landowners in order to take possession of their property. According to authorities, they received a tip concerning Weierman’s criminal activities and then conducted a survey of the 35 different properties that Weierman owned. They began contacting the people who had sold the property or transferred the title to Weierman. To the officer’s surprise, some of these folks had been dead for over 30 years. Police say that Weierman acquired the property illegally and then sold it for profit. He is being charged with 148 counts of forgery which is a felony. In addition to committing 148 acts of alleged forgery, Weierman owns a company called Dirty Deeds as well as running a summer camp. A 15-year-old who went to his military academy claims that Weierman struck him and his family filed one of the 45 complaints of child abuse against him. In addition, the attorney for the family claims that Weierman used the children at the military academy as a free source of labor for his appropriately-named Dirty Deeds company. The young man claimed the Weierman would force students to shovel dirt and rocks. Dirty Deeds is a land development and excavation company that provides services such as water abatement, underground drains, and grading and leveling of soil. The military academy is closed for the year, but the school’s officials “have not ruled out” opening up next year. 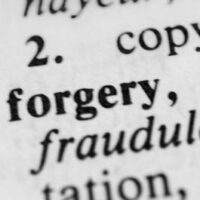 In Florida, forgery is considered a third-degree felony which is punishable by up to five years in prison. It is defined as falsifying, counterfeiting, or altering any document that has legal status for the purpose of committing some injury against another person. It’s hard to say what exactly Weierman’s defense to this will be. The prosecution has a long paper trail of forged documents and victims who signed over their properties from beyond the grave. The best Weierman can hope for is to cut a deal with prosecutors for less than the maximum penalty which would be something around 700 years in prison and a very large fine. Chances are, Weierman will see a prison cell for his role in the scheme. Indeed, his plot was so dastardly and cartoonishly evil that he will likely form the template for the villain of an entire generation of children’s book villains. If you have been charged with forgery or fraud in the West Palm Beach area, contact the Skier Law Firm P.A. We can help you raise a solid legal defense and get you a result that you can live with.